Three former civilian employees at the Marine Corps Logistics Base (MCLB) in Albany, Georgia, and one former employee of a military contractor were sentenced to prison following their guilty pleas to bribery and conspiracy offenses arising from their handling of military trucking contracts and theft of surplus military equipment, announced Assistant Attorney General Leslie R. Caldwell of the Justice Department’s Criminal Division and U.S. Attorney G.F. Peterman III of the Middle District of Georgia. 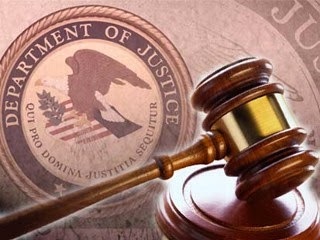 Mitchell Potts, 50, of Sylvester, Georgia, the former head of the Defense Logistics Agency (DLA) Transportation Office at the MCLB was sentenced to 10 years in prison for two counts of bribery. Jeffrey Philpot, 38, of Tifton, Georgia, the former lead transportation assistant under Potts in the DLA Transportation Office, was sentenced to seven years in prison for two counts of bribery. Shelby Janes, 69, of Albany, the former inventory control manager of the Distribution Management Center’s Fleet Support Division (FSD) at the MCLB, was sentenced to two years in prison for bribery. Kelli Durham, 35, of Leesburg, Georgia, the former manager of United Logistics (ULOC), an Albany-based trucking company and transportation broker, was sentenced to six months in prison for conspiracy to commit wire fraud. Collectively, the defendants were ordered to pay more than $2 million in forfeiture and restitution. According to court documents, between 2008 and 2012, Potts and Philpot accepted hundreds of thousands of dollars in bribes from Christopher Whitman, ULOC’s co-owner, to assure that ULOC was awarded commercial trucking contracts from the base. These contracts were loaded with gratuitous requirements, such as expedited service, expensive trailers and exclusive use, which requires that freight be shipped separately from other equipment, even if that results in a truck not being filled to capacity. At Whitman’s direction, Durham fraudulently re-brokered the loads obtained from DLA to independent truck drivers, but used far fewer trucks without the additional service requirements for which the government paid. To conceal the fraudulent re-brokering, Durham altered government-issued bills of lading and falsified delivery certifications. Durham also submitted false invoices to the government for payment. As a result of these contracts, ULOC grossed more than $37 million over less than four years and cost the government approximately $20 million in overcharges. Potts and Philpot admitted to participating in a separate bribery scheme in which they accepted bribes from truck drivers and a broker affiliated with another trucking company that did business with DLA at the MCLB. Between the two schemes, Potts took more than $275,000 in bribes, including cash, free rent, home improvements, meals, a hunting trip and other things of value. Philpot accepted a total of nearly $575,000 in bribes, including cash, a casino getaway, home improvements and collector items such as rare coins, a baby grand piano, a Werlitzer jukebox, firearms and a vehicle. Court documents further show that Janes accepted nearly $100,000 in bribes from Whitman and used his position within FSD to help Whitman steal more than $1 million in surplus military equipment from the base, including bulldozers, cranes and front-end loaders. To accomplish the thefts, Janes removed the surplus items—many of which had returned from conflict theatres abroad and been designated for refurbishment or auction—from Marine Corps inventory lists and arranged for Whitman’s company to transport them off the base. Whitman then arranged to improve the stolen equipment and sell it to private purchasers. Earlier this year, a jury in the Middle District of Georgia convicted Whitman, Shawn McCarty, a former DLA transportation assistant, and Bradford Newell, a former FSD contractor, of multiple counts of bribery, honest services fraud, theft of government property and obstruction of justice in connection with the schemes. On Sept. 10, 2015, Whitman was sentenced to 22 years, McCarty was sentenced to 10 years and Newell was sentenced to five years. Whitman was ordered to forfeit $18,860,313.75, McCarty was ordered to forfeit $15,410,151.55 and Newell was ordered to forfeit $513,600. Potts, Philpot, Janes and Durham all cooperated with the government’s investigation and testified in the trial. Furthermore, in February 2014, C.W. Smith, who helped arrange the sale of the surplus military equipment Whitman stole from the base, pleaded guilty to theft of government property and was subsequently sentenced to probation. The Naval Criminal Investigative Service, with assistance from the Dougherty County District Attorney’s Office Economic Crime Unit, Defense Criminal Investigative Service, DLA Office of the Inspector General and the Department of Labor Office of the Inspector General investigated the case. Deputy Chief J.P. Cooney and Trial Attorney Richard B. Evans of the Criminal Division’s Public Integrity Section and Assistant U.S. Attorney K. Alan Dasher of the Middle District of Georgia prosecuted the case. Assistant Deputy Chief Darrin McCullough of the Criminal Division’s Asset Forfeiture and Money Laundering Section and Assistant U.S. Attorney Danial Bennett of the Middle District of Georgia are handling forfeiture and restitution.